One of the wonders of Italian cuisine is its incredible variety, and much of that variety comes from the mix-and-match nature of so many of its dishes. You take a staple base ingredient like rice or pasta, and you pair that with all sorts of flavoring ingredients and come up with literally hundreds of variations on a theme. So pasta or risotto are not a single dish, but a whole category, a whole world of dishes that could literally fill a book, and has. The same goes for the flat omelette known as the frittata. The combinations are endless, as we have already featured a few on these pages: frittata di patate e cipolla (with potatoes and onion), frittata ai carciofi (with artichokes) and frittata ai peperoni (with bell peppers). 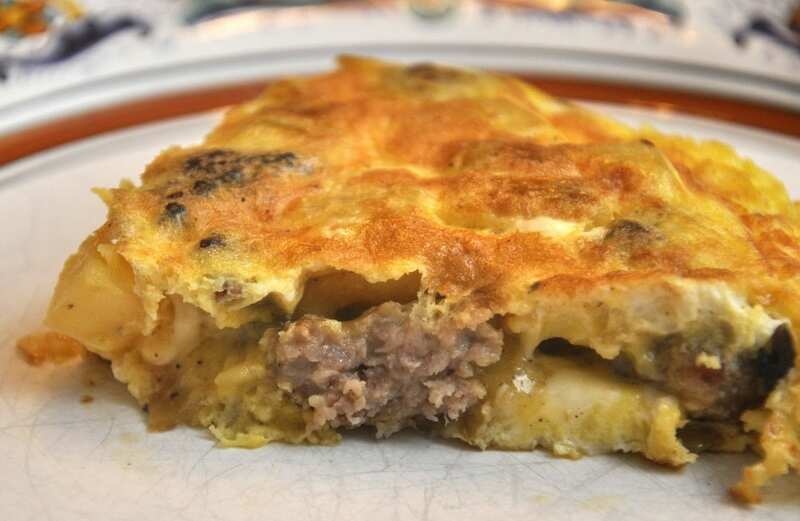 Here’s another example, one of my favorites on a chilly winter’s day when I want something a bit more substantial: a frittata with sausages and potatoes. But this same technique—and I’ve been careful to give you all the details you need—can be used to make any kind of frittata. 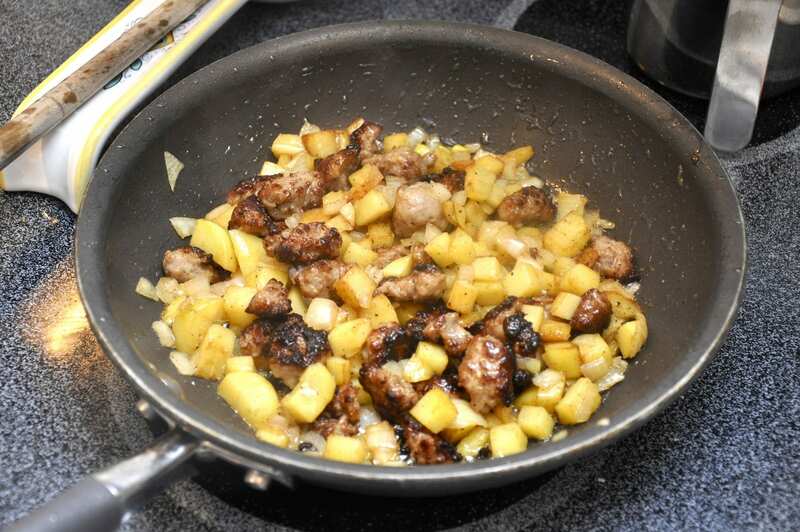 Just substitute the potato and sausage for whatever else you want to use, or omit them for a ‘plain’ frittata. 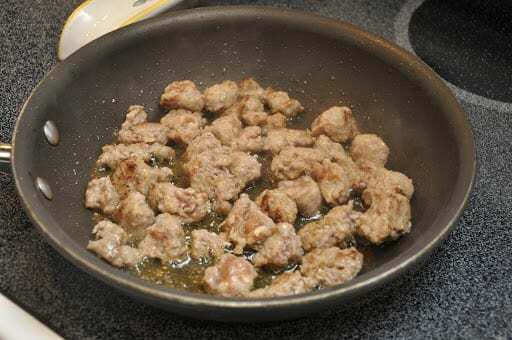 Start by taking a non-stick skillet and sautéing your sausages in a bit of olive oil over moderate heat. When they are nicely browned, you can remove them to prevent them from getting too brown, or just keep them in the pan. Now add your onion and potato and let them go until they are nice and tender, and not too brown. Season with salt and pepper as they sauté. I find that it helps to add some water and cover the skillet for a few minutes. This speeds up the cooking time and prevents burning. 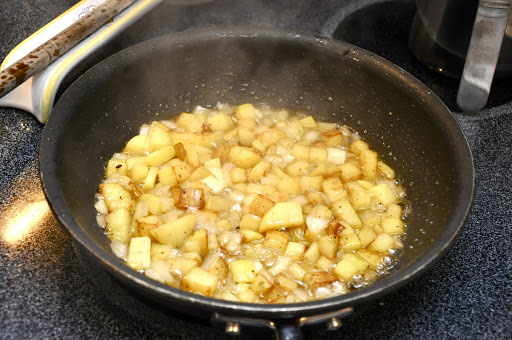 Once the potato and onion mixture is done, add back the sausage pieces if you’ve removed them. Let them sauté together and get to know one another for a minute or two. If you are using the parsley, now is the time to add it to the mixture. While the filling ingredients are getting acquainted, it’s time to make your egg base: Beat the eggs and grated cheese together in a bowl. If you are using pecorino, you should not need much salt, but with parmesan you will want to season the eggs a bit. Pour the egg mixture over the filling ingredients in the skillet and mix once with a spatula or wooden spoon. Once the flavoring ingredients are more or less evenly distributed though the eggs, stop and let the eggs cook, still over moderate heat, until they have almost entirely set, except for a thin layer of raw egg on top, and the bottom has nicely browned (but not too much). During this step, too, you can cover the skillet with a lid to help the eggs set. The whole process should not take more than 8-10 minutes. Use a spatula to check the bottom to make sure it’s browning nicely but not burning. Regulate the heat if need be. Now comes the tricky part: you need to flip the frittata over. I do this by using two plates. You slip the frittata out, cooked side down, onto a dinner plate. Then top that plate with another, and flip the two plates over, so that the frittata is now upside down, with the runny, uncooked side facing up. Add a little more olive oil into the empty skillet, then slide the frittata back into the skillet. You will now want to let the runny side cook. This will take a lot less time than before, as you eggs should have already almost completely set, perhaps 3-5 minutes more. Again, check the bottom by raising a bit of the omelette with a spatula and take a peek underneath. It may look a bit misshapen at this point, but not to worry, all will be well in the end. When the frittata is done, slide it out onto a dinner plate again. I find that the last-cooked side is the most attractive, so once again, I use another plate and flip it over onto its ‘pretty’ side. Let it cool for a few minutes and serve, cut into wedges. The two-plated flipping technique is one that I really like, since it is basically foolproof. But if you like, you can use a single plate. You take the plate and cover the skillet, and then flip as described above. This saves you cleaning another plate but be careful, as the skillet is obviously going to be very hot. Another technique is to run the skillet under a broiler for a few minutes, until the eggs are set and the top is nicely browned. This is even more foolproof than the two-plate flipping method, but don’t think that the frittata turns out as attractive, and since the top has not ‘tasted’ any olive oil, it is a bit less savory. Finally, they sell special double-skillets with interlocking handles specially-made for making frittata. I have never used one, so I can’t comment on how well it works. 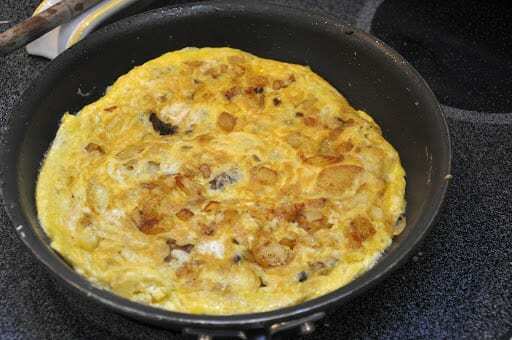 A frittata can be eaten warm or at room temperature. Leftover frittata is perfectly delicious, and can be used to fill a sandwich—in the old says, this was a favorite lunch of Italian workmen and field hands. A frittata is a versatile dish. It makes a lovely and light secondo, but can be a snack or antipasto, or serve as part of a buffet. The one thing it never is—at least in Italy—is breakfast. But then again, why not? This recipe will give you the basic technique for making a frittata. Once the potato and onion mixture is done, add back the sausage pieces if you've removed them. Let them sauté together and get to know one another for a minute or two. If you are using the parsley, now is the time to add it to the mixture. 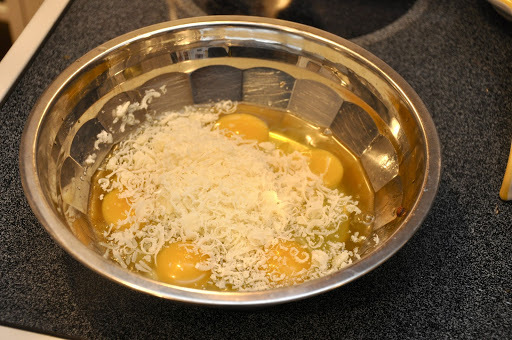 While the filling ingredients are getting acquainted, it's time to make your egg base: Beat the eggs and grated cheese together in a bowl. If you are using pecorino, you should not need much salt, but with parmesan you will want to season the eggs a bit. Once the flavoring ingredients are more or less evenly distributed though the eggs, stop and let the eggs cook, still over moderate heat, until they have almost entirely set, except for a thin layer of raw egg on top, and the bottom has nicely browned (but not too much). During this step, too, you can cover the skillet with a lid to help the eggs set. The whole process should not take more than 8-10 minutes. Use a spatula to check the bottom to make sure it's browning nicely but not burning. Regulate the heat if need be. When the frittata is done, slide it out onto a dinner plate again. I find that the last-cooked side is the most attractive, so once again, I use another plate and flip it over onto its 'pretty' side. Let the frittata cool for a few minutes before serving, cut into wedges. A frittata is equally good at room temperature. Love, love, LOVE fritattas! I could enjoy a million varieties of this Italian creation! Thanks, Roz! I feel just the same way! Lizzy, Belinda, Kate and Kath: Thanks for your comments! My door is always open! I've been thinking about trying a frittata and have been unsure about the best method to use. I really like your 2 plate method. Thanks! Fantastic! This is looks great. We invite you to share this and other posts on Food Frenzy. 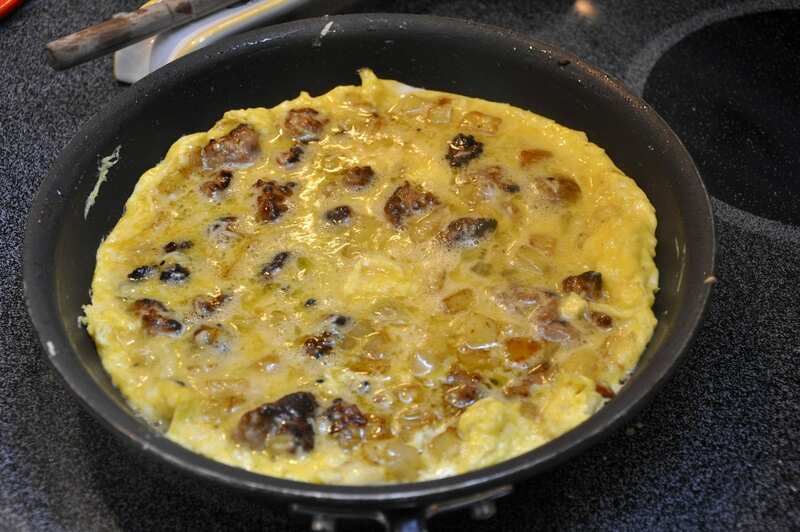 Absolutely delicious – love that you've used sausage in a frittata! That is perfectly done. You are a master with the cast iron. I'll be there in 10 minutes! Oh, wow! This looks wonderfully delicious, Frank!